“Hire this awesome Raleigh magician; he’s a rock star for kids! Captain Kid was certainly a hit, with the kids and adults alike! I’m glad to have captured some of my son’s (the birthday boy) reactions on video, because they were priceless. His act kept even the younger kids (2-3 years old) engaged, and he had the older kids howling with laughter and excitement. He let parents take pictures of the kids posing with his parrot Jax at the end — it was icing on the birthday cake. Captain Kid was amazing at our daughters 6 year birthday party. He had the kids fully entertained for a solid hour, and they have been talking about it ever since. Captain Kid did not disappoint one bit. Even the adults stayed for the entire show and were loving it!! He even allowed the kids to take pictures afterward with the amazing bird he brought, Thank again Captain Kid for saving the day! Captain Kid was a great success (with kids and adults alike) at my twins’ sixth birthday party! We all had fun and everyone was enchanted from start to finish. And Jax (the parrot) was a great partner to the Captain. Truthfully, this performance was also kind of a present to my husband and myself as well. Captain Kid was the magical DJ at our wedding almost 11 years ago. We had so much fun then that we wanted to share the fun with our kids as well! Captain Kid rocks!! Thank you KC for making my husband and daughter’s birthday party an event to remember!! He did an AMAZING job entertaining adults and kids at a party with over 70 people. KC and his parrot definitely are a great team performance. People were laughing so hard at some times and then mesmerized at other times. Such a professional and well done show! We greatly appreciated how flexible he was. He was so polite and easy to talk to for a stressed out party-planning momma like me! I would HIGHLY recommend him for your next party! Everyone LOVED the show! Worth every penny! He is amazing and hilarious. He is part of the magic act all the way. Wonderful Act For All Ages! Laughed The Whole Way Through! Fun, Fun, Fun! We all (the kids AND adults) laughed the whole way through. KC’s magic was great and the parrot was awesome! Highly recommended. No worries, you’re in safe hands – Captain Kid parties for a living! Let’s face it . . If you’re like most parents, you have no idea how to keep a bunch of rambunctious kids involved while not destroying your house. ♥ Captain Kid is a Children’s Entertainment Specialist! This is why Captain Kid developed the “Birthday Party Success“ booklet. Follow it’s directions for the perfect party! It will also keep the party “stress-free”. 1) You want an entertainer that will show up on time. ♥ This highly acclaimed Raleigh magician is organized. He only does 4 shows per day so he can always be on time and presentable. He will not double book because he received a better-paying party. He makes the whole experience “oh, so easy” for you! This means you can relax! 2) You want your Raleigh magician not to scare or annoy the children with a “clownish” costume. ♥ No worries, Captain Kid is short, fat, bald and INCREDIBLY HANDSOME! He wears business casual clothes – something that the kids are used to seeing. He wants your child-star to be comfortable. Why do so many children’s entertainers wear clown-like costumes? No idea! So you have no worries about scary clowns! 3) You want your Raleigh magician to have an age-appropriate show. ♥ Captain Kid ‘s show is tailor-made for kids and while adults enjoy it, it is for the kids, but adults love it as well! It has no violence, no blood and guts, no fire, no guns, no knives, no swords, no guillotines, no animal traps, no mutilations, and no strange things are swallowed and no “adult humor”. There are plenty of ways to entertain kids without resorting to this, and his show is so darn funny! With 30 years of experience, you can feel secure that the material Captain Kid uses is age-appropriate. 4) You want an entertainer with an innovative and engaging show. ♥ Imagine a show that is exciting and fast moving like a roller coaster. All the tricks are original and have been highly honed for thirty years. Captain Kid’s magic uses regular objects you can find in a home. His magic is relatable and has more impact because everyone knows his props. Your happiness is his prime directive. This Raleigh magician is a “personality” based performer. He is a true “Rock Star” in children’s entertainment. This means you’ll feel safe because the amazing Captain Kid knows how to keep kids happy! Check out these examples now! in the funniest way possible! C5) You want your party to have lots of audience participation. Captain Kid makes sure every child feels important by allowing all to participate “on stage” (if they want to participate). This is true even if the party has twenty-five kids! There are also lots of movements and responses that will make every child feel personally involved. This means every child feels like part of the show because they are! 6) You want a show that will make your child the ★STAR★. Every children’s entertainer knows he needs to make the birthday child the star. A big problem is some kids don’t want to come up on “stage”. This is exceptionally common in young birthday children. The child, especially a young one, may be under a lot of pressure and stress. The party is about the child, thrusting her into the limelight. More people are in his home than ever before. Parents talk to her about behaving. Last, SUPRISE, there is this total stranger jumping around in his living room – and worse the entertainer’s costume makes the child scared! ♥ Of course, Captain Kid will make your child the star if he or she wants to be the star. Captain Kid is very sensitive, and won’t push a child into the spotlight if he or she is not ready for it. He recommends having the birthday child watch the videos above to become acquainted with me and the show. This means you can trust Captain Kid to make your child and guests feel important! 7) You want the show to keep the kids enthralled. ♥ There is no question the kids and adults will be captivated at your party! Just watch Captain Kid ‘s demo reels! So this means the kids will be captivated for the whole show and won’t be wandering around your house! 8) You want a show that all ALL AGES will think is “fantastic” not just a “kiddie” show. ♥ Yes, he is rare! You can have a fantastic children’s entertainer that appeals to adults too! Magic that families can enjoy TOGETHER! Just look at his reviews! So this means the kids and adults will be captivated for the whole show and won’t be wandering around your house! Check out these performance videos now! Raleigh magician Captain Kid books up fast, so forgive me if he is already booked up on your special day! 9) You want a Raleigh magician with an animal co-star. ♥ Captain Kid is followed around by Gentle Giant Jax the Parrot. Rabbits and doves are so yesterday. . . The spectacular Parrot Jax is amazing. Jax the Parrot is potty-trained, but rabbits, doves, and other animals don’t care where or when they do their “business”. This means your party will be remembered fondly! Look At Parrot Jax Now! 10) You want a show the kids and your friends will talk about (in good terms!) for weeks later. ♥ No problem! Captain Kid ‘s show is exciting, and both adults and kids will absolutely love it. Captain Kid carefully crafts his show like a Disney® movie. It is created for kids but also designed to keep adults engaged. Best of all, it is stress-free! This means you know your entertainment won’t embarrass you, but delight your guests, and they will talk about your great party! 11) You want this party to be perfect – you’re spending a lot of money on it. ♥ Captain Kid loves performing and would do so without pay if he could. He works with charities for disabled children – FREE or at low-cost. To him it is not just a job. Isn’t this what you want? Yes? Captain Kid has been married for 19 years and has a teenage son. He understands parents because he is one! Feel secure, he’s tried and tested, and quality endorsed – he’ll take special care of you. 12) You want to spend your money wisely, not waste it on an inexpensive entertainer who may fulfill SOME of your needs. You really want Captain Kid! The Show Is Interactive Theatre for Kids! Captain Kid has a maximum of only four openings on your special day. Booking is on a first-come, first-serve basis. P.S. Ask him about his fundraisers. Raleigh Magician “Captain Kid” has been doing kid’s birthday magic shows for over 30 years, and is by far, the most experienced birthday magician in the area. Performing from Alaska to Florida, and as well as Europe, you are getting national grade magical entertainment here in Raleigh NC. 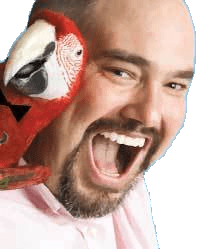 Raleigh Magician Captain Kid performs with his gentle giant parrot Jax in a fun-filled rollercoaster of children’s comedy magic that can last up to an hour and a half! Thousands of parents have loved his magic show, consequently, many booking two or three times. Gentle giant Jax is a 15 y/o greenwing macaw whose ancestors lived in the rainforest of Central and South America. She was hatched in Florida, however, was raised by Raleigh magician Captain Kid here in Raleigh She is a show-bird, and loves the spotlight! Availability is limited, so call him today! This Raleigh Magician has seen everything and has a handy booklet providing parents with advice to achieve a successful party and that people will talk about it for years. Read or skim this booklet for your fantastic results! In Raleigh, magicians come and go, but Raleigh magician Captain Kid has been making a comfortable living doing birthday magic show in Raleigh for over 15 years and nationally has done birthday magic shows for an additional 15 years. That’s 30 years of experience! Birthday party magic isn’t a hobby for this magician -quite the opposite, it is his profession. Raleigh Magician Captain Kid isn’t just for birthdays! He provides great fundraisers and does school and daycares with shows through the week. Fundraisers can make $3,000 or more and daycare’s and schools get special pricing. Call and talk to him for a pressure-free explanation of what magician Captain Kid can do for you.